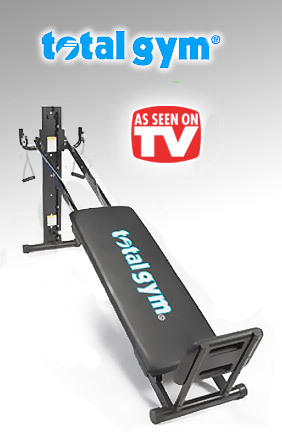 Total Gym 3000 exercise equipment is a one-stop-shop for your fitness needs. It is a mid-level system that can be utilized by most people, whether you are just starting out, or you have a little more experience. The whole family can use the machine, because a healthy family is a happy family. And, it won’t break the bank. The Total Gym 3000 has been replaced by the NEW Total Gym XLS, with an updated design, and a multitude of new features. The key to getting and staying fit is a convenient, all-in-one system, that gives you results. Staying committed is possible, and you can change your body. Working out and staying fit can become as routine as brushing your teeth, with the Total Gym 3000. The best of both worlds qualities of Total Gym 3000 make it unique and special because it works with you, not against you. To help you get the most out of your machine, the Total Gym 3000 model comes equipped with the quick start video, as well as a 6-8 minute workout that will get your heart pumping. 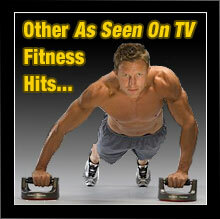 Exercise options – over 60 Total Gym exercises for you to choose from. The benefits of having the Total Gym 3000 in your home definitely include feeling the burn of your legs and upper body muscles when you workout with the squat station and added wing accessory. But the Total Gym 3000 truly is a complete total body workout. While pumping your legs you can work your arms – all while burning calories and fat and in the comfort of your own home. Add the perks of an instructional exercise poster and workout videos with over 60 exercises, and you have all you need to have a perfect workout. What more could you want? With the 3000, you’ll receive the fundamental workouts and workout tools you need to get into shape quickly. This workout system takes all of the guesswork out of getting into shape with over 60 fun and easy to follow exercises! Quick Start video – To help you get started with your Total Gym! 6-8 minute bonus video – 12 intense workouts for a quick and effective cardio session! All the parts, accessories, and add-ons are covered by a guarantee that if anything breaks, it will be replaced immediately – no questions asked! So you can dive right back into your workout and not worry about it. Compare the Total Gym 3000 to other models and see how it stacks up. Total Gym understands the importance of your health and personal fitness. That’s why it is so easy for you to start right away with flexible payment options and a 30-Day risk-free trial! 30-Day Trial – You can test out this machine in your home for 30 days, no risks! You can return the system if for any reason you’re not satisfied and get a full refund or credit. Warranty – You get a Lifetime warranty on your Total Gym system. Easy ways to pay – Flexible payment choices of payments that work for you. Complimentary Shipping – a $100 value! 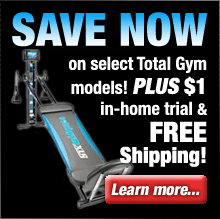 * The above guarantee is for purchases made through Total Gym Direct only. Be sure to check the current return policy of all retail partners presented on TVgyms.com for the most up-to-date information. Get your heart pumping today. Order your 3000 right now for some great pricing options and the most rewarding experience in home gym equipment. When I first saw the Total Gym on TV I thought that it sounded intriguing but a little too good to be true. However I got to try it out for free when a buddy of mine got one and I've got to say I was wrong. One workout on his and I was sold and had to have my own. I've had my Total Gym 3000 for 3 weeks now and the difference in the quality of workouts I can get compared to my old Soloflex is amazing. Not to knock my Soloflex as it's a solid machine but man this Total Gym is a lot more versatile. 5 stars for this bad boy. Wow... when they say total body workout they aren't kidding! I just had my first workout on my Total Gym and I don't think there's a muscle in my body that isn't feeling the burn. I'm glad I took the plunge and decided to try this out. I've been out of shape too long and based on what I'm feeling now this is the machine that's going to fix that. Total Body is Totally Right! Total Gym 3000 = Total Body Workout. Sounds like a bogus sales pitch but I gotta say this machine delivers the goods. I'm feeling some mad burn like I never have before. And I know my way around the gym so I know aht I'm talking about. Gimme 6 months with this sleek fitness machine and I'll be throwing the mad moves on Chuck Norris like he ain't never seen. I was looking for an exercise system that would fit my meager budget yet offer enough versatility to keep me from getting bored. I did some research online and the Total Gym kept coming up as a recommended exercise system. When I saw that they offered you 30 days to try it out I figured I'd give the 3000 model a shot. After a couple of weeks I was sold and decided to keep it. I've been using it for about a year now and it's really helped me get into shape. I've gotten rid of most of my beer gut while packing on some muscle at the same time. I do have to say though that as much as I like my Total Gym I would like to eventually sell it and upgrade to the XLS which has some extra features that I'd love to have. I think that would help me take my workouts to the next level. I been exercising now for 8 weeks on a daily usage. I do feel better but have seen no results in body looks. The gym is small compared to other equipment. The bench had developed a separation on the material at the rolled ends. I feel the gym is well built. The set up was easy, the training video is fast to follow.I still have a positive out look for results. Overall I'm happy with the equipment. eventuality wood have found the error and called. The Total Gym is total fun! I have had my Total Gym for well over a month and I can't believe how good I feel. I actually look forward to my workouts. I would like to have more videos to follow to help keep it fresh. I was so happy with the gym I ordered the Cyclo trainer to my workout. Now that is really worth it. I absolutely love the different ways I can use the gym. I plan to add the Pilates eventually . I can't say enough about this product. Although the Total Gym is a little heavy for me, I enjoy using it and it has helped me work out more than usual. I swim during the summer and when swim season is over, I don't want to pay an outrageous price to join a gym to just use the pool. The Total Gym is convenient for me to use at the comfortability of my own home, no driving to a gym and waiting for workout equipment. I would recommend this product to any of my friends, it is well worth the buy. I have seen improvements in my body since using the Total Gym. I also like that I can work out different parts of my body on one system. What's even better, is my whole family uses the Total Gym since its arrived. Paying for gym membership for a whole entire family is expensive. Now we have the luxury to use with the feasible price we paid for the Total Gym. It's a great piece.I've been doing the starter progam which works all the body parts.It realy gives me a total body workout no pun intened.It is very easy to setup and to put away.I have cats in my home and you know they like too scrath pads.The padded bench board easly removes to store so cats can't get too it.Also folds up and stores up side the wall out of the way.